President Barack Obama and First Lady Michelle Obama wait in the Map Room of the White House on May 19, 2010. Saturday marks the second-to-last Valentine's Day that the Obamas will spend as the first couple, but a review of their past celebrations show that they tend to keep the holiday low-key. From spending time with their daughters to indulging with a foodie-friendly night out, the Obamas haven't stuck to a particular routine. The first couple have not officially revealed their plans this year, but the president is scheduled to be in Palm Springs, California, after attending a cyber-security summit in San Francisco on Friday. The White House has not released the first lady’s schedule yet, but if they are not together on the holiday it won’t be the first time. Here's a review of the Obamas' presidential Valentine's Days past. 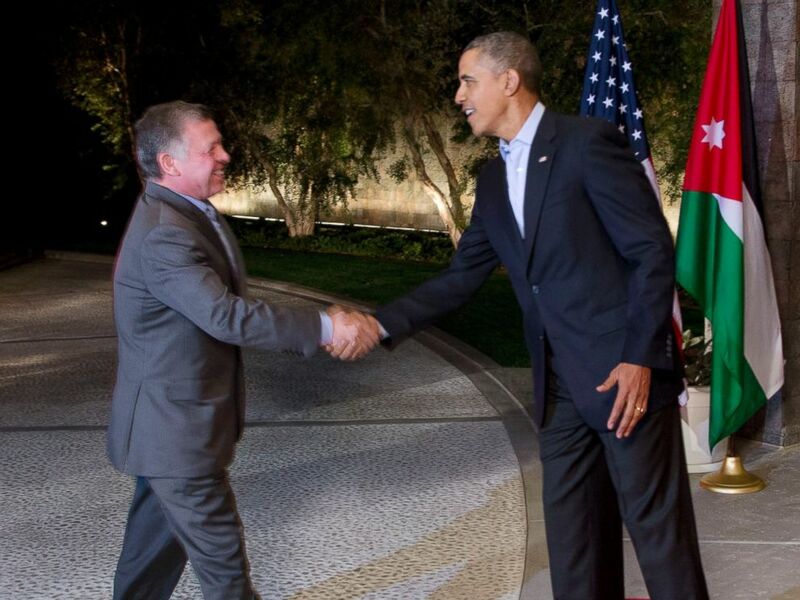 His Majesty King Abdullah II of Jordan and President Barack Obama shake hands at the Annenberg Retreat at Sunnylands in Rancho Mirage, Calif. on Feb. 14, 2014. The Obamas were on opposite sides of the country on Valentine's Day in 2014, with the president spending time with King Abdullah II of Jordan in California. They clearly didn't forget the holiday though, because they tweeted love notes to one another. In addition, they went on a dinner date at D.C. restaurant Oyamel the week before Valentine's Day, according to The New York Daily News. Years before, Michelle Obama had said that the restaurant of famed chef Jose Andres was one of her favorite restaurants in D.C. "because I love Latin food -- a good menu, good margaritas." The timing of Valentine's Day always poses a bit of a problem for the Obamas' calendars because the holiday comes almost a month after Michelle Obama's birthday, when they normally do something special. That was more true than ever in 2014 when the first lady celebrated her 50th birthday with a celebrity-filled dance party at the White House. When the Obamas find a chef that they like, they stay loyal. 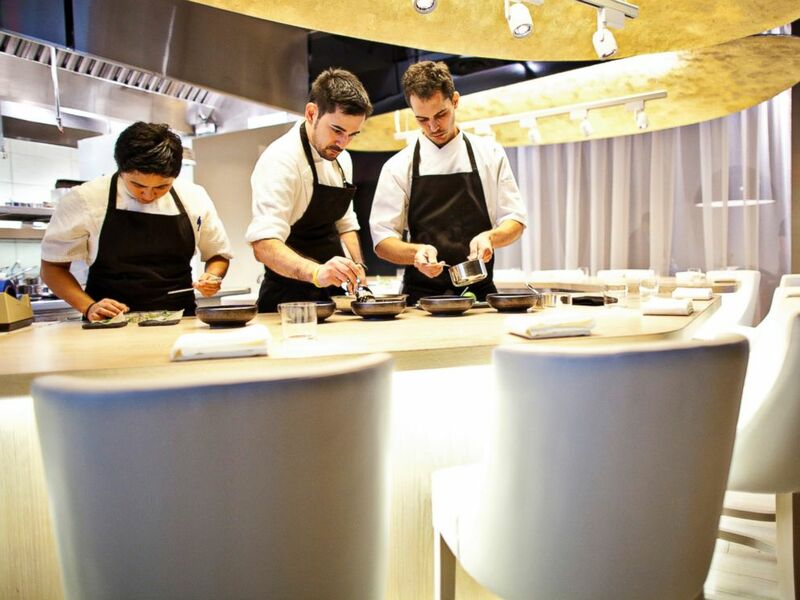 Employees prepare food at Jose Andres' Minibar in Penn Quarter, Washington, DC. on Nov. 20, 2012. President Obama was clear that he had no intentions of missing that meal as he joked about the holiday while in Georgia earlier in the day. "I can’t imagine a more romantic way to spend Valentine’s Day than with all of you, with all the press here,” Obama said teasingly to the traveling media. "Actually, Michelle says hello. She made me promise to get back in time for our date tonight. That’s important." "I've already got a gift, got the flowers," he said. "I was telling folks: The flowers are a little easier, though, because I got this rose garden. A lot of people, you know, keeping flowers around." He was sure to send out a throwback picture of the couple on Twitter. Michelle Obama has made healthy eating with a hearty serving of vegetables among the priorities of her "Let's Move" campaign, so it came as little surprise when the couple dined at Vermillion in Alexandria, Virginia, in 2012. The contemporary American restaurant bases its regularly-changing menus on local and seasonal foods, and Politico reported at the time that it indulged the Obamas with venison au poivre for her and rib-eye steak for him. "That kind of exposure has helped drive business, without a doubt," Vermillion's general manager David Hammond told The Associated Press. "A lot of our regular diners have been congratulatory. There's a real positive buzz." 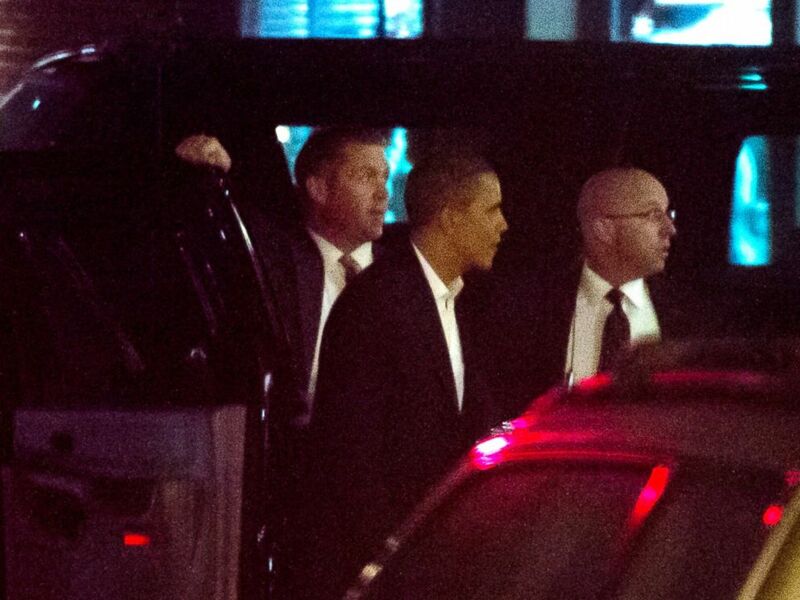 President Barack Obama arrives at Vermilion Restaurant in Alexandria, Va., for a Valentine's Day dinner with first lady Michelle Obama on Feb. 14, 2012. There was only one year during Obama's two terms where it was unclear what the couple did to celebrate Valentine's Day, and that was 2011. Even though they were not forthcoming with their plans that year, Michelle Obama was happy to talk about what she wanted to receive. "Jewelry always," the first lady said during an interview on "Live! With Regis and Kelly." "You can't go wrong." "You gotta keep the romance alive, even in the White House," she said later in the interview. The first family celebrated together at Camp David in 2010 because Valentine's Day fell in the middle of President's Day weekend. Malia and Sasha Obama joined their parents on a weekend trip to the presidential retreat in Thurmont, Maryland, just 61 miles north of the hubbub of Washington, D.C.
For their first Valentine's Day after begin sworn in to office, the Obamas decided to ditch D.C. and go back to their hometown of Chicago. The 2009 trip included a stay at their home in Chicago's Hyde Park neighborhood and dinner at Table 52, which is owned by Oprah Winfrey's former chef. The menu focused on Southern cuisine, serving staples like grits with sausage and catfish jambalaya. President Barack Obama and first lady Michelle Obama depart Table 52 restaurant after enjoying a Valentine's Day dinner together in Chicago, Ill. on Feb. 14, 2009.